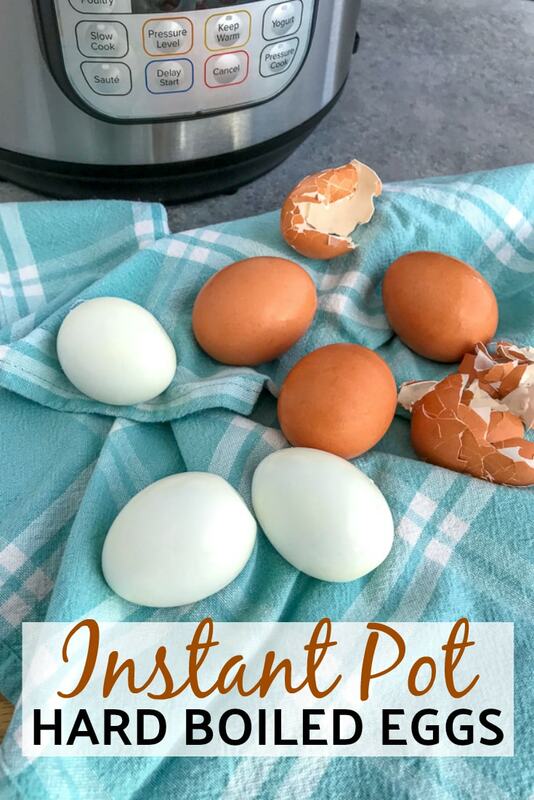 Instant Pot Hard Boiled Eggs – learn how to make hard boiled eggs easily and quickly in your Instant Pot! This simple, quick and proven method makes perfect, easy-to-peel eggs every single time. This recipe is what you need if you’re short on time, looking to make deviled eggs, or adding it to a meal prep box such as my Easy Protein Bistro Snack Box! When I first got married, I wanted to do everything myself. I wanted to learn how to make almond milk, cashew milk, nut butter, and so forth. So naturally, I tried my hand at making my own deviled eggs for a party. I’ll never forget the times I had tried and failed at making those perfectly cooked, unblemished hard boiled eggs. Oh, the frustration with trying to peel them gently, only to pull chunks of egg white off. Or they would simply come apart. Who wants to serve chunky-looking deviled eggs?? Not this girl! Needless to say, I tried and tried, only to fail and give up. I wasn’t wasteful, I turned those disastrous-looking eggs into egg salad! HA! 😀 Then I tried it in my new Instant Pot and let me just say – I will never make them any other way. The Instant Pot is the way to go! Trust me on this. 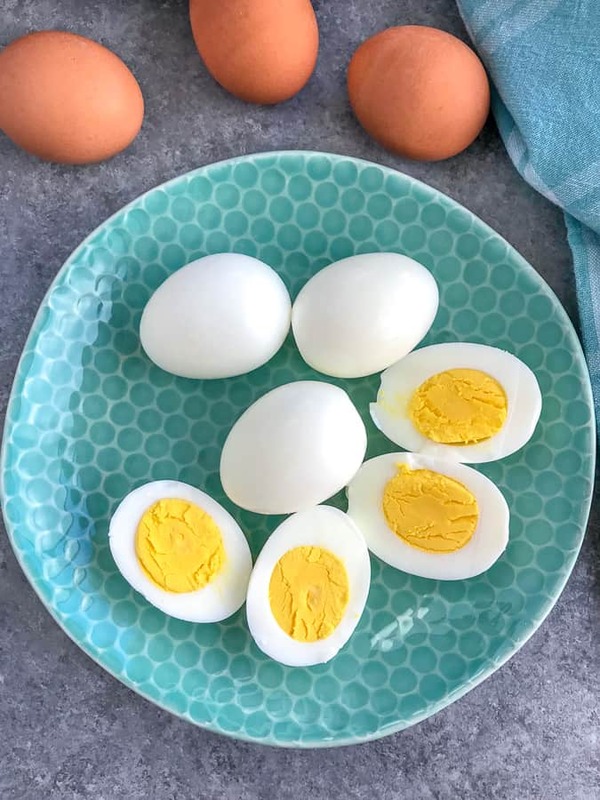 PERFECT HARD BOILED EGGS- finally! This method is truly fool-proof. I promise you that. 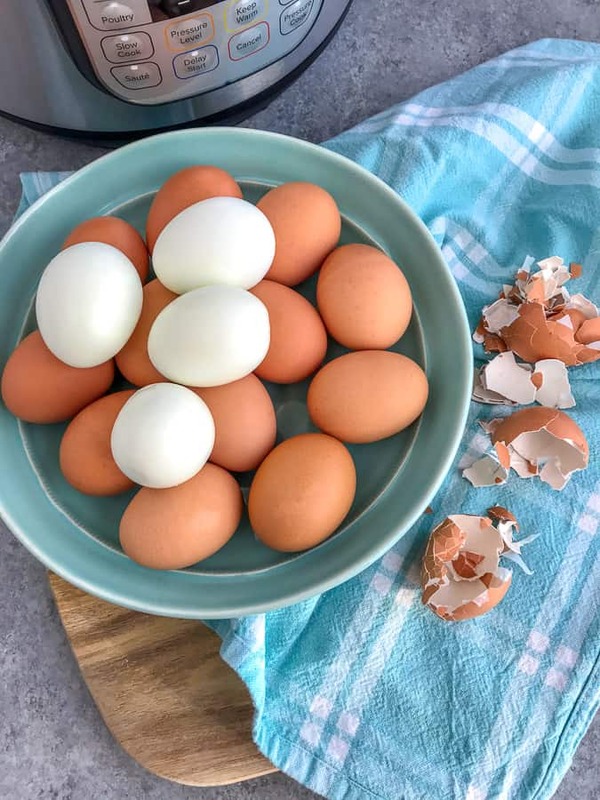 You don’t have to keep an eye on the stove, you don’t have to worry about under-cooked or over-cooked hard boiled eggs, and (if you’re like the old me) you no longer have to worry about peeling chunks of the egg white off as you peel! 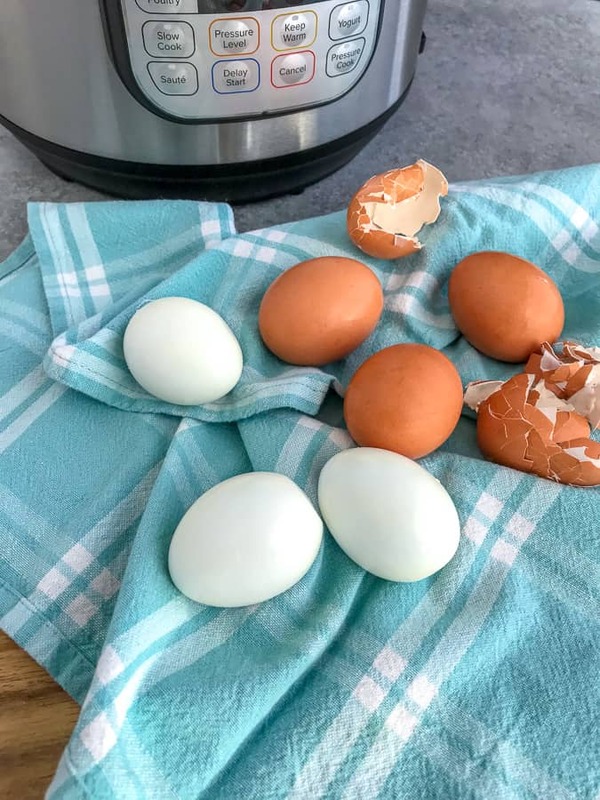 – then you can easily make the best Instant Pot Hard Boiled Eggs every time! Full, printable directions available in the recipe card below! Place the steamer basket that came with your Instant Pot inside the pot. Add 1 1/2 to 2 cups of water to the pot. The level of the water should rest just below the steamer basket. 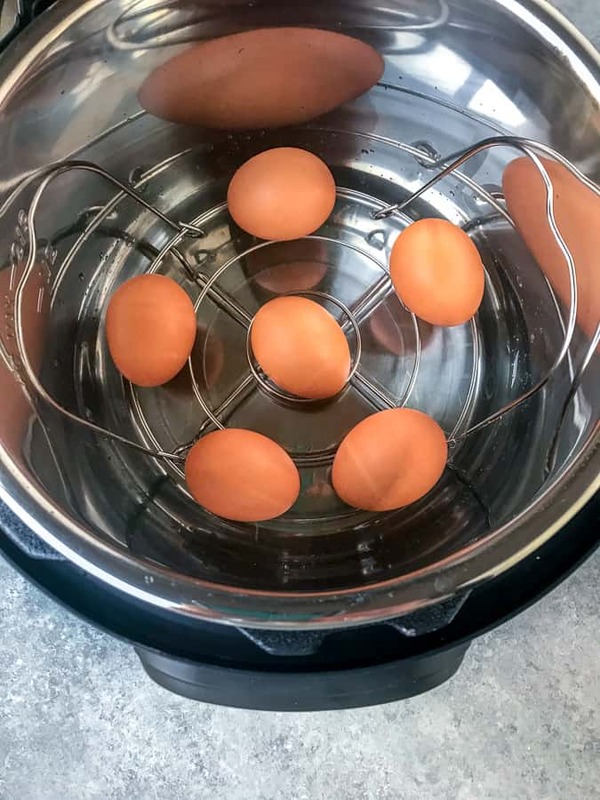 Add cold eggs to the pot (1-12 eggs) onto the steamer basket in a single layer, avoiding stacking and making sure there is space between each one. Close the lid and set the steam valve to the “sealed” position. Select the Pressure Cook option, on HIGH, and set the timer for 5 minutes. The pot will take 5-6 minutes to come to pressure before it starts to cook. When the timer goes off, allow for a 5 minute natural release before doing a quick release. Carefully remove the lid once all the pressure has left the pot. 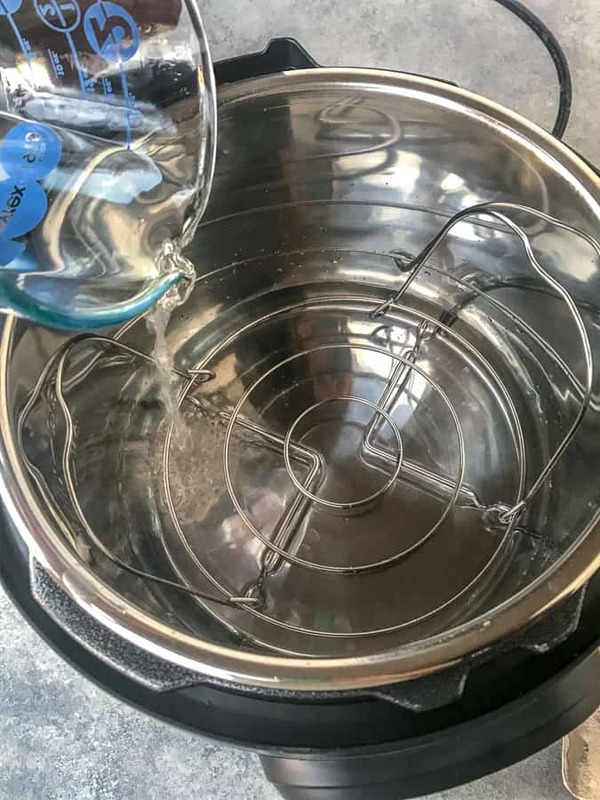 You can either safely remove the pot from the cooker using potholders and add a good amount of ice to the pot (essentially only using the pot to cook and cool) OR you can individually remove each egg to a large bowl of ice water using a slotted spoon. Change out the water or add more ice, as needed, until the eggs are thoroughly cooled. Lightly tap the ends and edges of the shell to crack and begin peeling! 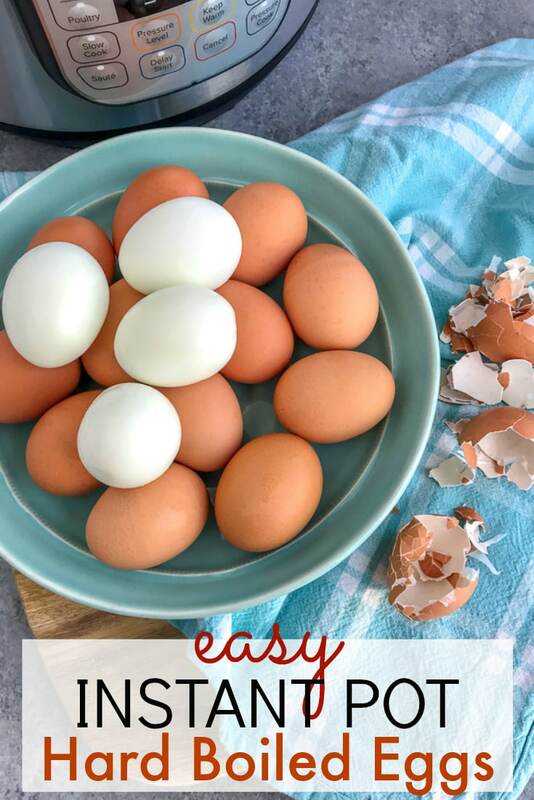 And there you have it – easy, quick and perfect hard boiled eggs in 15 minutes! These will keep in the fridge for up to one week. They are great to have on hand for salads, as a grab-n-go breakfast or snack option, to make deviled eggs, or for whatever your heart fancies! 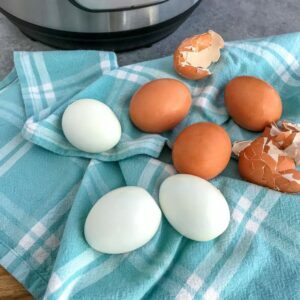 Learn how to quickly and easily make hard boiled eggs in your Instant Pot in 15 minutes! A wonderful proven method you will use time and again. Add the steamer rack to the bottom of the pot and pour in water needed. Water level should rest below the rack. Add the eggs to the pot onto the steamer basket in a single layer, avoiding stacking and making sure there is space between each one. Select the Pressure Cook option, on HIGH, and set the time for 5 minutes. Do a natural 5 minute release, followed by a quick release. Quickly remove the eggs from the pot with a slotted spoon to a large bowl of icy water to cool. Peel as soon as the eggs have completely cooled. Select the Pressure Cook option, on HIGH, and set the time for 3 minutes, followed by a careful quick release. 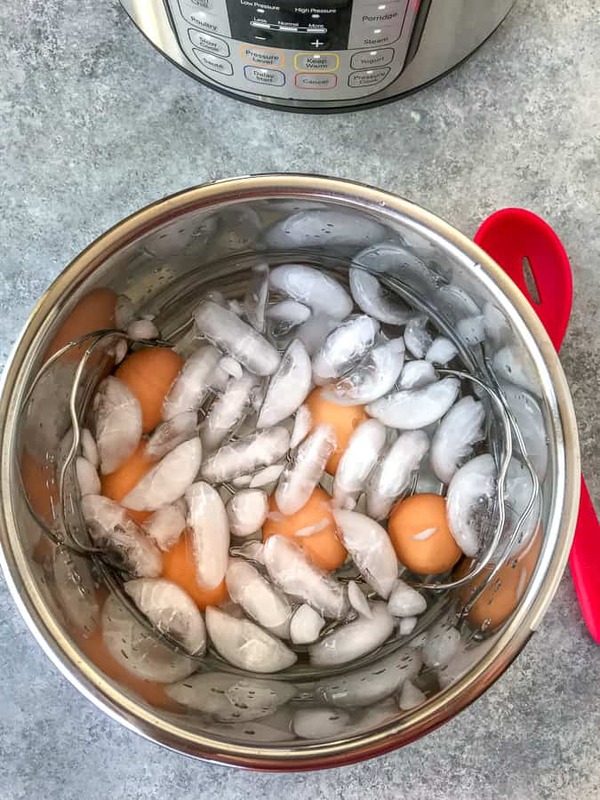 Quickly remove the eggs from the pot with a slotted spoon to a large bowl of icy water to cool. Peel as soon as the eggs have completely cooled.